This lemon and raspberry cake is citrusy, sour and sweet. 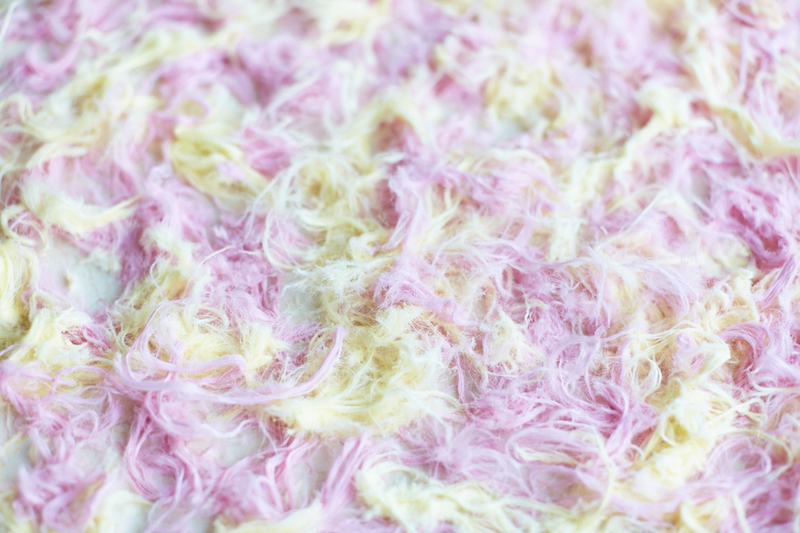 We’ve decorated it with Pashmak Persian fairy floss, which is made from sesame and sugar, and is a revelation for us – it comes in loads of lovely flavours like pistachio, orange blossom, rose and saffron. It’s a wonderful thing to decorate with. Trifles, Eton mess and cakes will always have room for a little fairy floss. The ombré buttercream smears give a stunning finish to your cake. It’s a rough and ready sort of look – just using a palette knife to paste on pink and yellow streaks that merge into each other naturally. Preheat the oven to 180°C/gas 6 and line the base of two 18cm cake tins with baking paper, greasing the sides with butter. Divide the mixture evenly between the prepared cake tins and smooth over with a palette knife. Bake in the oven for 30–40 minutes until goldenbrown and springy. Leave to cool for about 15 minutes before turning out onto a wire rack to cool completely. Using a hand-held whisk, electric whisk or stand mixer, whip the butter and icing sugar together until they are light and fluffy, adding milk to loosen. You want your buttercream to be spreadable but firm. Divide the buttercream between two bowls. To one bowl, add the lemon curd and yellow colouring to give a lovely lemony pastel yellow shade. To the other bowl add a handful of squished raspberries and pink colouring to give a bright pink. Don’t mix completely – that way it has a nice marbled effect. Layer the sponges using your lemon and raspberry buttercream alternately, plus any extra lemon curd. To ice, use a palette knife to spread thick smears of pink and yellow icing randomly all over the outside of the cake. Make sure you clean your palette knife in between scooping the buttercream. 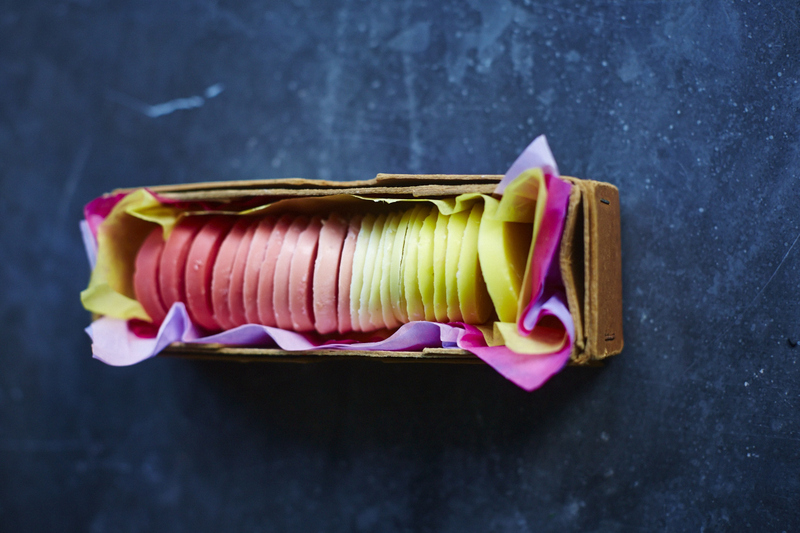 Decorate with fairy floss in the centre and surround with pink and yellow ombré chocolate disks. Dim the lights and bring out the sparklers! First you need to temper your white chocolate using your preferred method. (We describe both proper tempering and a quick microwave method on the website). Working very quickly, add touches of colour to the mix. Fill a few moulds about 0.5cm thick with this paler chocolate, then gradually add more colouring to the bowl of chocolate and fill a few more moulds to build up the ombré effect. Leave to set at room temperature, then pop the chocolates out of the bases. 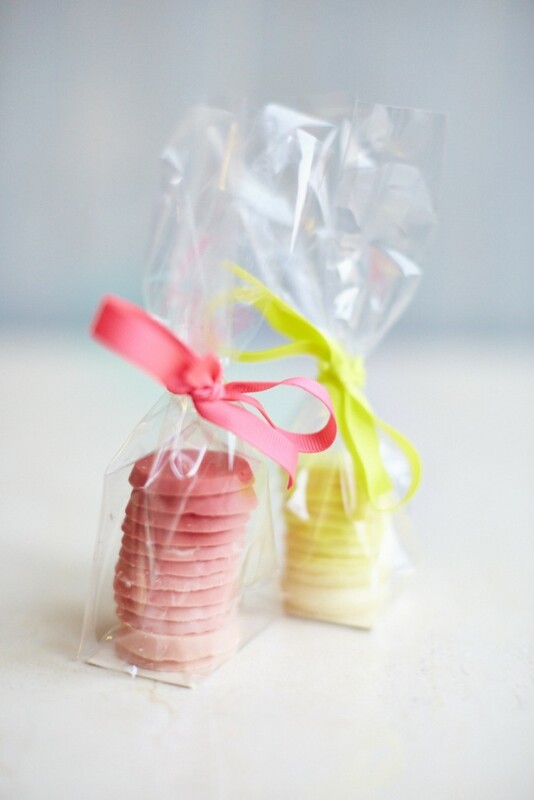 Package up in an ombré fade in cellophane sweetie bags, or line them up on top of a cake.